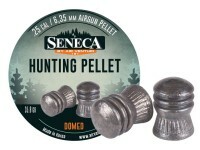 Deliver heavy rounds into paper or pest with these .25 caliber pellets from Seneca. These domed pellets weigh in at 35.8gr. 100 pellets per container. Things I would have changed: Turn it into a slug, add more pellets to the container. What others should know: All the Eunjin pellet are great there big and heavy if the container had 200 to 300 pellets and they were slugs then they would be perfect for the guns I shoot. Things I liked: The pellots are consistent in quality from one pellot to the next. They fire well in my air gun and have provided consistent groups at 50 yards of dime size. Good impact take down small game fast. Things I would have changed: Tape the lids to the cans, they came apart during unpackaging them and the pellots spilled all over. What others should know: Fit good in Hatsan Air Rifles, do not get the pointed ones because they are to long for Hatsan air rifles.